I have been to many religious sites not just Hindu temple but famous and holy Muslim Dargah and Christian Churches. 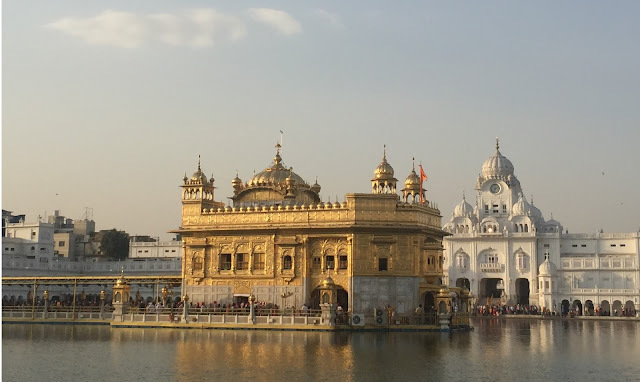 I have seen many Gurudwara but Harmandir Sahib was always on my bucket list and finally I was able to visit this holiest Gurudwara of Sikhism last week. Harmandir Sahib popularly known as Golden Temple was founded in 1577 and its not only religious place but symbol of equality and brotherhood. I was in Amrtisar for three days and every day I visited Harmandir Sahib, not just during morning hours but seeing the template at night was great experience. Late night flight from Bangalore to Delhi and then early morning flight from Delhi, I reached the holy city of Amritsar in Punjab. After checking in to hotel, my first place to explore was Harmandir Sahib. Four entrances (representing the four directions) to get into the Harmandir Sahib also symbolize the openness of the Sikhs towards all people and religions. 10 mins Ricksaw ride from my hotel and I reached temple from entrance close to Jallianwala Bagh. I bought a head scarf because everyone have to cover head properly to visit the temple. There are shoe keeping counter thats free of cost. And then you can wash your feet before entering to holy complex. Marble walkway surrounds the temple with milky white buildings protecting it on all four sides. Temple complex is big area, its not just the golden temple overlaid in the center of holy pool but temple complex has many other historical and significant place like Akal takht (throne of timeless God), Ber baba buddha ji, Sikh museum. First day in the morning I did cursory survey around the temple complex and looking at the crowd decided to come back in the evening and visit the sanctum sanctorum where holy book "Guru Granth Saheb" is kept. And thats the best time to see the glittering beauty of golden temple, spectacular. There was queue but I had to line up hardly for 15 mins. Taking photos inside the temple is not allowed. Inside two floors of sheer brilliance, amazed to see the architecture and Sikh gurus sat on cushions chanting from sacred books. You can go up to the roof. Though I have seen and visited many temples, mosques, churches and let me be honest here , I am not very religious. I must admit the Harmandir Sahib is the only place where I felt completely natural, soothing, calm and worry free. I think its because of atmosphere out there and the real idea behind building this temple is to have such feeling where everyone irrespective of religion, cast, color can come and be part of it. Inviting space for everyone, not just to sit, sleep but Golden Temple has world's largest free kitchen, Langar. Serving free food for 50000 people daily (In special occasion number goes up to 100,000) is no easy task. But you know why its different and special because 90% of working staff is made up of volunteer (mostly the visitors) along with 300 permanent. Delicious food but most importantly completely hygienic. I spent most of my time sitting by the lake on the floor and admiring the beautiful temple in front.